For junior/senior-level undergraduate RF Electronics and Communication Systems courses in Electronic Technology programs. Also appropriate as a supplemental text for courses in Electrical Engineering programs. 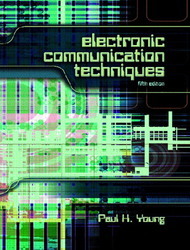 Helping students become successful designers and troubleshooters of useful communications products, this easy-to-read, hands-on text covers devices, circuits and systems analysis, and design concepts in a way that keeps students involved and active in the learning process. It includes familiar existing systems and introduces a broad range of new communication technologies in wireless, high definition TV with video compression and a broad range of fiber-optic devices, system parameters and networking. Grounded in sound theory and engineering principles, it uses algebra-based mathematics through calculus, and a logical design-and-analysis approach, and now includes the very latest information on optical, Bluetooth, “Wi-Fi” cellular and Internet devices, circuits, and systems. 5. Modulation and Amplitude-Modulated Systems. 9. Frequency and Phase Modulation. 11. Pulse and Digital Modulation. 14. Transmission Lines and Waveguides. 15. Antennas and Radiowave Propagation. 17. Digital Radio and Space Communication. Appendix A: Introducing the Impulse Function. Appendix B: Filter Attenuation Curves. Appendix C: Derivation of Frequency Response for PLLs. Appendix E: Abbreviations and Acronyms.